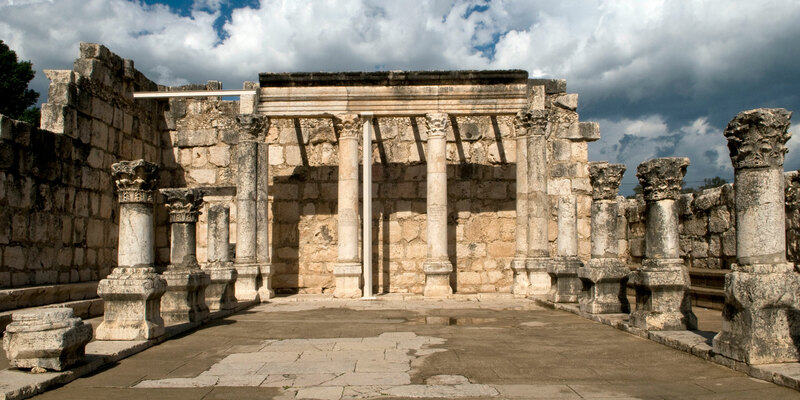 The ruins of an ancient synagogue in Capernaum from the 4th century A.D. Image via Wikimeida Commons. Along with temples and sanctuaries, the Book of Mormon mentions synagogues as being a part of the religious architecture of Nephite culture, mainly during the era of the reign of judges. Synagogues in the Book of Mormon were vital to the worship culture of Book of Mormon peoples. However, they do not appear to have had much of a social function beyond this. As Adams explained, Book of Mormon synagogues focused primarily on providing places of public worship, teaching, and prayer. By understanding the nature of synagogues in the Book of Mormon, readers can better appreciate the dedication on the part of Alma and his faithful brethren. They were eager to impart the word of God to as many people as possible, taking advantage of any opportunity to preach. This included bravely preaching in the religious structures of their opponents; going, as it were, into enemy territory to declare a competing doctrine. Victor L. Ludlow has suggested that “the custom of open dialogue was a part of synagogue practice in the Book of Mormon,” based on the fact that Alma was allowed to preach in non-Nephite assemblies.15 This would explain why Alma and Amulek targeted public synagogues as well as private settings in their missionary efforts: they wanted to utilize any forum in which they could point their audience towards the one who would himself preach the gospel of the kingdom in synagogues (Matthew 4:23; Luke 4:16–30). A. Keith Thompson, “Nephite Insights into Israelite Worship Practices Before the Babylonian Captivity,” Interpreter: A Journal of Mormon Scripture 3 (2013): 155–195. William J. Adams Jr., “Synagogues in the Book of Mormon,” Journal of Book of Mormon Studies 9, no. 1 (2000): 4–13, 76. John W. Welch, “Synagogues in the Book of Mormon,” in Reexploring the Book of Mormon: A Decade of New Research, ed. John W. Welch (Salt Lake City and Provo, UT: Deseret Book and FARMS, 1992), 193–195. 1. For more on the mysterious Amlekites, see Book of Mormon Central, “How were the Amlicites and Amalekites Related? (Alma 2:11),” KnoWhy 109 (May 27, 2016). 2. Readers must be cautious to carefully define and understand how the Book of Mormon uses these words and phrases, and must be cautious not to impose modern culturally inherited definitions back onto Book of Mormon peoples. For example on the ancient definition of the word temple and on the typical functions of ancient temples, see generally Hugh Nibley, “The Meaning of the Temple,” in Temple and Cosmos, The Collected Works of Hugh Nibley: Volume 12 (Salt Lake City and Provo, UT: Deseret Book and FARMS, 1992), 1–41; John M. Lundquist, “What is a Temple? A Preliminary Typology,” in Temples of the Ancient World: Ritual and Symbolism, ed. Donald W. Parry (Salt Lake City and Provo, UT: Deseret Book and FARMS, 1994), 83–117. 3. Theological Dictionary of the New Testament, ed. Gerhard Friedrich (Grand Rapids, MI: Eerdmans, 1971), 7:802–805. 4. Lee Levine, “Synagogue,” in The Oxford Companion to the Bible, ed. Bruce M. Metzger and Michael D. Coogan (New York, NY: Oxford University Press, 1993), 721–724, quote at 722. The scholarly literature on the origins of the ancient synagogue is extensive. See generally “The Origin of the Synagogue,” Proceedings of the American Academy for Jewish Research 1 (1928–1930): 49–59; J. Weingreen, “The Origin of the Synagogue,” Hermathena 98 (1964): 68–84; Lee I. Levine, “The Nature and Origin of the Palestinian Synagogue Reconsidered,” Journal of Biblical Literature 115, no. 3 (1996): 425–448; Steven Fine, Sacred Realm: The Emergence of the Synagogue in the Ancient World (New York, NY: Oxford University Press, 1996); Anders Runesson, The Origins of the Synagogue: A Socio-Historical Study, Coniectanea Biblica New Testament Series 37 (Carolinasalen, Kungshuset, Lundagård: Almqvist & Wiksell International, 2001); Lee I. Levine, The Ancient Synagogue: The First Thousand Years (New Haven, Conn: Yale Universtiy Press, 2005); Anders Runneson, Donald D. Binder, and Birger Olsson, The Ancient Synagogue from its Origins to 200 C.E. (Leiden: Brill, 2008). 6. See the overview provided by A. Keith Thompson, “Nephite Insights into Israelite Worship Practices Before the Babylonian Captivity,” Interpreter: A Journal of Mormon Scripture 3 (2013): 155–195. 7. William J. Adams Jr., “Synagogues in the Book of Mormon,” Journal of Book of Mormon Studies 9, no. 1 (2000): 7. 8. Adams, “Synagogues in the Book of Mormon,” 7. 9. Thompson, “Nephite Insights into Israelite Worship Practices Before the Babylonian Captivity,” 159. 10. Adams, “Synagogues in the Book of Mormon,” 11, scripture citations removed. 11. Ross Anderson, Understanding the Book of Mormon: A Quick Christian Guide to the Mormon Holy Book (Grand Rapids, MI: Zondervan, 2009), 70. 12. See Webster’s 1828 dictionary, online at https://1828.mshaffer.com. 13. See Book of Mormon Central, “Did Ancient Israelites Build Temples Outside of Jerusalem? (2 Nephi 5:16),” KnoWhy 31 (February 11, 2016). 14. See the commentary by Brant A. Gardner, Second Witness: Analytical and Contextual Commentary on the Book of Mormon, 6 vols. (Salt Lake City, UT: Greg Kofford Books, 2007), 4:253–256. Gardner notes that it’s very unlikely that Nephite synagogues remained static. As the Nephites integrated with New World cultures, their architecture, including their sacred architecture, would’ve undoubtedly evolved over time, although the function would’ve remained essentially the same. 15. Victor L. Ludlow, “Synagogue(s),” in Book of Mormon Reference Companion, ed. Dennis L. Largey (Salt Lake City, UT: Deseret Book, 2003), 749.